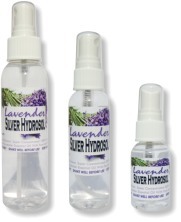 Lavender Silver Hydrosol Buy 3 Get 1 FREE! BONUS!! 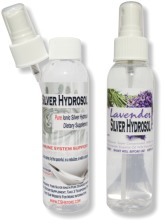 All orders will ship with a trial size of our new Lavender Colloidal Silver Antibiotic Gel! Both Silver Ions and Lavender are naturally produced substances that are anti-bacterial, anti-fungal and anti-viral! "I'm a flight attendant for a major airline. The other day in First Class a little boy had an accident in his diaper...causing a stink is an understatement! It was horrible!! I had just received your Lavender spray that day and thought this would be a good test! "Sprayed the dog with the Lavender CS, smell gone immediately! I even asked the neighbor to smell the dog and she was amazed! So then I sprayed his dog bed in the bedroom and his chair in the living room, all smells are gone. Try it! Only $2.99 FLAT Rate Shipping!